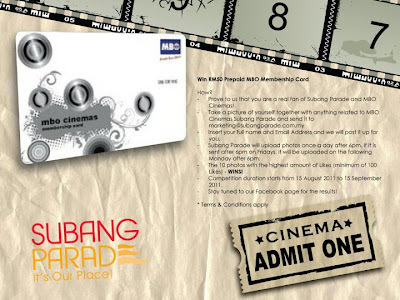 Show and prove that you are a real fan of Subang Parade and MBO Cinema! Send it to marketing@subangparade.com.my together with your full name and Email Address and we will post it up for you. 10 photos which have the highest amount of Likes (minimum of 100 Likes) wins. Visit Subang Parade Facebook fan page for more detail.